Last weekend we went on a big adventure. A big train adventure. A real one. A Christmas one. And the whole night was magical! We had been reading The Polar Express almost every day & night for over a week and talking about how we would be taking a train ride soon. Liam's comprehension of the book has truly amazed me, and he talks about it all the time! Especially the sound of Santa's (or sometimes the reindeer's) sleigh bells! Then as a big surprise, we watched The Polar Express movie the night before... Liam has very limited screen time, so this was a huge treat for him! We all cuddled up on the couch in our Christmas pajamas, with a big bowl of popcorn, & watched together! He loved every minute and surprisingly lasted through the whole thing. That night he was full of anticipation for all the fun that was to come the next day! 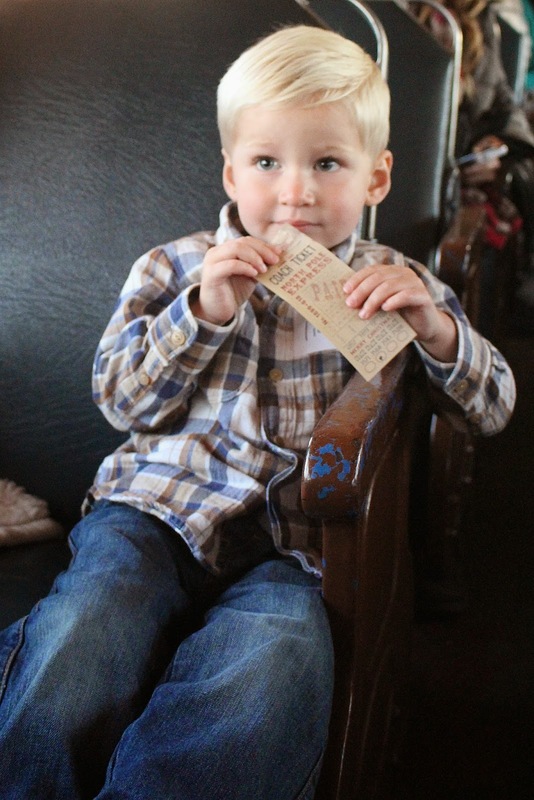 He proudly handed out the tickets to each of us and held onto his for the entire ride! Reading the book for days definitely helped him to "get" the whole experience and he just soaked it all up! We rode through the mountains as the sun was setting & Christmas music was blaring. There was fiddle playing & elves dancing in the aisles; Liam even busted a few moves! There was a tad bit of chaos & noise, but Liam was wrapped up in the moment and seemed to love every minute! There were tiny cups of hot cocoa, just perfect for little hands & freshly baked chocolate chip cookies made by Mrs. Claus herself! Santa came aboard as well, and while Liam was a bit timid at first, he was completely in awe of the bell Santa gave him! His very own bell from the reindeer! That small bell with the red ribbon hasn't left his bedside since! We took plenty of photos throughout the ride, but are still adjusting to our new DSLR camera. Definitely haven't mastered the nighttime shots... But some moments pass you by so quickly that you get what you get! These are still special memories we want to remember! I am already looking forward to next year's ride and having an extra tot in tow!!! Oh, my, goodness!! So glad yall had a wonderful time! You can definitely tell he was taking it all in, so precious! That looks like so much fun! We read the Polar Express every Christmas Eve growing up and it's still one of my favorites! It's one of my favorites too! I love that Liam appreciates it, even at a young age! That is seriously the sweetest thing I have ever seen!!! What an amazing idea! This is the absolute sweetest thing! Polar Express is one of my favorite Christmas books/movies and how cool to get to live it out in real life! This train looks like so much fun! I love how they did the hot cocoa and everything! Shooting at night is hard! I ended up getting an external flash as a result. Oh my gosh this sounds amazing!! What a fun little adventure to have. Also, shooting in low light is the worst! Such a fun experience!!! I have been searching for a local train ride with no luck. Liam looks so grown up in some of those pictures! Which btw, I think they all turned out gorgeous!!! Your pictures have always been amazing though. I was surprised when you mentioned just getting a dslr as I always thought that was what you were shooting with! Polar Express was always such a magical book to me! So cute! I thought about doing this with Mac, but heard that the one here was really crowded and not as much fun as expected. This one looks great though! Maybe we'll try this next year, when Mim's a bit older and can enjoy it too.